I asked my bestie, who also happens to be a rockin’ graphic designer, to send me her biggest griefs when working with clients. Michelle and I have worked together for 10 years, and I love working with her. She’s open and honest, and allows me be creative… and it doesn’t help that we both have interesting cats and love kayaking. So when I suggested a blog post about “how to work with your graphic designer,” she proposed that I write it instead. So forgive my AP Style errors as I provide to you the Rosetta Stone key into the graphic designer’s brain. When you throw around technical words, you might think you’re helping by giving us direction. But when you ask for a “high resolution web image” or a “jpeg with a transparent background” (neither of which exist, by the way), it’s a giant red flag that you don’t know what you’re talking about, and it’s only going to lead to more work for both of us. It’s OK – you don’t need to know how to build a car to get an oil change, and you don’t need to know how to format a file to get the right one. Just tell us HOW you’re going to use it, and we’ll make sure you get the correct format for the job. 2. The same goes with the design. Ever walk down the street, see someone with an odd outfit, and think “How on earth did they think that looks good? !” Designers think the same thing when you suggest neon glows and star burst symbols….unless, of course, you’re making a 90’s themed party invite or a garage sale flyer. A lot of people think a graphic designer is meant to simply take your ideas and convert them to a file, down to the exact pixel placement. My phrase for that is “a monkey at a typewriter.” And sometimes, that’s OK. But you’re essentially paying us for our creative advice, so why not take it? You wouldn’t tell a hunting guide that you’re going to shoot the spike buck, when he’s suggesting you to take the 12 pointer, would you? Give us boundaries, like brand guidelines, colors and a “mood,” but let us guide you to something amazing after that, or at least be upfront from the beginning that you have a specific look in mind. 3. Don’t like our work? Tell us! Nothing’s worse than doing a few versions of a project for a client, and re-working it again and again, only to be headed in a completely wrong direction than what you intended, because you were trying to be subtle or “nice” in your critique. 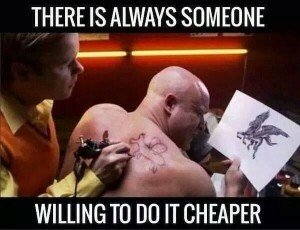 Any designer who’s worth something can handle it. No one comes up with a winner 100% of the time. What we can’t handle, though, is “I don’t like it.” “Why?” “I don’t know, I just don’t like it.” That doesn’t help us find a solution. Be specific. Maybe you don’t like the color. Perhaps it’s the “serious” mood it conveys, when you wanted something more youthful. Again, you don’t need to know the terminology, but be honest and constructive. If I had a nickel for every time someone told me to “make it pop,” I would never have to work again. And if you’re wondering why we groan when you suggest that we “make the logo bigger,” do a quick google search of that phrase. That’s all I have to say about that. 6. Be realistic in your timelines. We understand that last-minute stuff does come up. But if you’re expecting an overnight logo, it’s just not going to happen. Freelance designers often have a regular 8-5 (or longer…) daytime design job, so we can only work on your projects after the day is done. 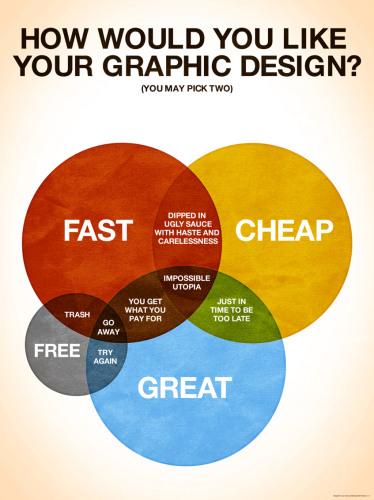 [And if your designer is good at what they do, chances are, they’ll have other clients too.] Talk to your designer at the start of your project about what your hopes are for a delivery date of the final project, and what your actual, drop-dead deadline is. Remember, we’ll send you some proofs first, so we’ll need to account some time in there to make changes and corrections. 7. Throw us a bone, and we’ll work like a dog for you. Every designer has their favorite clients, and they’ll drop everything they’re doing to work on their projects. Why? They give us ample time to work on projects, and then some. They give us creative freedom within their guidelines. They pay promptly and well. But it’s not always the monetary reward that makes us wag our tails. It could be as little as a cup of coffee (so we can stay up later to finish your project), or all the way up to a referral. Word of mouth has gotten me most of my clients, so passing our number on to others can be a huge boost to designers! But perhaps the easiest thing you can do is let us know how we helped you. It goes a lot further than you might think. I get a card from Michelle every time she pays me for a job, something she definitely doesn’t have to do. But it makes me smile, and keeps her on the top of my list. 🙂 I once got an email from a client telling me how she couldn’t have started her company with my help, and how she felt completely lost until I stepped in – and all I did was give her a few tutorials on her WordPress site and design her a logo! The praise I got from her lasted much longer than her check. Her attitude and excitement over my work made me feel like I could do anything! I hope none of these tips come off as pretentious or cocky, as that wasn’t my intention, but rather, help translate our processes to your goals. Think of us as your guide, rather than your caddy, and if you treat us as such, we’ll not only point out the clearest path but carry your clubs as well. Or at least the good ones will.